Raise the stakes in the holiday hilarity department with Faux Real’s T-shirts. 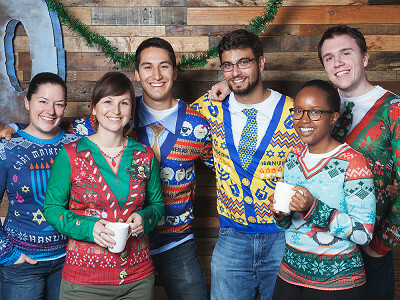 Their intentionally tacky designs emulate ugly holiday sweaters in every way, without the bulk and itchiness. Soft, breathable, and comfortable, these T-shirts look the part without any of fuss—but with all of the festivity. Given that they look like the gaudiest of attire, it’s a pleasant surprise how nice and durable the fabric feels. Brothers Jeff, Scott, and Ben Gray developed these T-shirts when they noticed ugly holiday sweater parties popping up everywhere. Using a dye-sublimation printer, Faux Real creates shirts that capture every photo-realistic detail of an ugly holiday sweater, right down to the (faux) snowflake buttons. With styles for both men and women, just about anyone can get in on the gaudy act. Whether it’s sheep, gingerbread men, or hopped-up holiday penguins that get you in the holiday spirit, these T-shirts are the right fit. Hello everyone! I'm proud to introduce Faux Real to The Grommet. I'd be happy to answer any questions you have! Question: Why in the world is any T shirt $32? @Jacob I agree.. I def love the concept and idea. I was thinking of purchasing but not fo 32. I will look and see if I can find it cheaper... It is still just a t-shirt but very cute idea. I hope I can find something similar under 25 bucks. Good morning to you, too, everybody! It's tough to consider Faux Real just a t-shirt. It's made of polyester so it's not your average cotton tee. It's also extremely comfortable, which is reason enough to purchase this over your typical ugly sweater that will having you itching yourself raw. We certainly don't want you all breaking the bank on this, but with how long this will last and the hilarity that will ensure, this is a holiday garment for years. And Frank, over-priced is a harsh word. The Makers we work with are not out to get you. They are just very young and not yet at a point where they can sell a product at a mass-produced price. But with enough support on site, they can! @Mike I also agree that most of your items are overpriced. Ouch, Caryn. I guess no love for the underdogs today. I'm curious as to how the sizes run. I looked these up Faux Real on Amazon and found them for much less expensive (between $10 and $24); however, the reviews all said they ran very small. I'd not sure if it's a 'faux' company selling a cheaper knock-off or if this brand really does run that small. Any feedback would be helpful. Thank you. Hi Kathleen, I found that they run true to my size. A large fit me like any large would. They are form fitting by design so that could be what they are referencing. As you can see in the photo and video, a bunch of us in the office wore them and didn't find them to be a problem. I would love this shirt in a light weight cotton. I don't mind the price but maybe cotton would cost less? It's possible, Tanya, but I don't know how feasible the dye-sublimation process would be, which is what creates these amazing designs. Is the pattern on the back side too? Yes it is, George! Front to back you are looking silly and stylish! This would be great for the many Christmas-themed runs if it came in a performance tee option. Hi Cheryl, the polyester creates a performance tee-like feel. I was comparing it to a light, loose-fitting UnderArmor. It is very comfortable! I agree $32 is a bit overpriced. $25 would be my max I'd may for the shirt. Good to know, F! Hopefully Faux Real lights it up like a menorah today and they get to a point where they can produce the shirts at that price point. In the meantime, I think we can both agree they look awesome! Too expensive for a t-shirt. Hi Stan, as I said before, it's not really just a t-shirt. The polyester material gives it a performance tee-esque feel, which is a good enough reason to ditch the wool ugly sweaters that turn your body into Itch City! Thanks for the input, Marcia! Maybe I'm crazy for liking the feel of polyester over cotton sometimes. It's a nice change of pace. Let's agree, either one is better than wool. Do you at least have a favorite design? @Mike and Marcia. Look at it this way. Polyester pills, and all it takes is one washing to make it look even cheaper, tackier -- and ugly. The design is on the sleeves and the back. I think that is much more costly to make, especially if you are not printing 1000's at a time. Joann, you are quite right. The dye-sublimation printing process is incredibly intensive. It is a big driver of the price, but without it, you wouldn't have the amazing designs! These are very funny and I LOVE the idea. Are there more styles available? Thanks, Kathy! This is all we have for now, but keep an eye out for any updates. They'll be in your daily email! You guys! I can't believe you're complaining about $32 for a long-sleeve , two sided shirt. This price point is perfect, in my opinion. Have you priced t-shirts lately? Super cute idea and hope they do well! Thanks for the kind words, Dee Dee! @Dee Dee agreed! These are awesome! @April Yes I agree with the last two comments. One would expect to spend that or more for a good quality T-shirt! All the Grommet products I have purchased were worth the price and cannot be found anywhere else. Keep the innovations coming! You got it, Susan! Thanks for the kind words! For me polyester is like being wrapped in plastic; oh wait a minute, it is! These would be more appealing to me if they were at least a cotton/poly blend. And I have to agree with a lot of these other folks-- kind of pricy. Thanks for the comment, Evon! We don't want you breaking the bank, but we are willing to bet you will be getting your money's worth. For me, polyester feels like being wrapped in a thin wisp of clouds. @Mike "For me, polyester feels like being wrapped in a thin wisp of clouds." If they don't add this to the blurb description above they are missing out! I don't find these overpriced, and the fact that they are polyester will contribute to the longevity of the item and wear well right out of the dryer. I spent $28 on a short-sleeved Halloween tee and it was only printed on one side. They are a great idea, and just think of all the holiday get-togethers you could wear them to, while getting lots of attention! Thanks for the kind words, Molly! That's what I'm saying! I hope you enjoy! @Molly I was thinking the same thing. If it were cotton, then after just a few washes they'd be faded out and wouldn't look good for very long. Too costly. $20 is tops. Very limited use for a joke. Every holiday party for the rest of your life doesn't seem "limited" to me, Mr. Mario. Boy... some of you need the Bah Humbug! shirt for sure! I think the shirts are adorable and I don't find the shirt too expensive at all. Good work! I ordered and LOVE it........but after almost $6 for shipping cost my total was $37.84. At that price, I was only able to order one. : ( If the price of the item had been around $27, I would have been more comfortable to order another. Daphne, you can say that again! I hope you enjoy! And Angie, same to you! Hopefully Faux Real can make that happen in the future! @Mike Hi Mike, I ordered two today, one for my Son and one for myself. That brings the total above $50, so no shipping or handling charges. I hope they fit right. They're really cute! @Lisa Hi again Mike or Grommet, if it's too small for me (I'm a "real" XXL) am I able to return it for credit/refund? Hi Lisa, so glad to hear it! If you find it doesn't fit, you can check out our return policy here. I just wish your sizes were not "Made in China" sizes. XXL is not an 18. There are a lot of us who are larger who would love to be able to buy something like this. I am still laughing and am in love with the Penguins. Alas, I need a "real" XXL, not a faux XXL. Hi Cea, great word play at the end there. Hopefully with enough support on here, Faux Real can develop more sizes! Love your item. Looks very neat. I always wear Christmas t-shirts on the holidays because its the one time of year I don't have to wear my uniform. I always research so when I saw your product I thought I would look at see if there was a cheaper type out there. $32 is too much for any t-shirt. Plus since I wear them to work and I work around electricity and flames I wanted one in cotton that would not melt to me if a spark or arc touched it. I found this on Amazon and it doesn't look much different than your product. Plus it is made of the polyester that you keep touting. Can you tell me what makes your better than this one for $10. I know the price is for a small but that's what I need. Hi Duke, thanks for the comment. It probably doesn't look much different because it is the exact same thing. We work to ensure our prices are aligned with the market. What makes it better is that we at The Grommet are trying to create a partnership with our Makers not hack down their prices like it's a rainforest. I totally agree with Dee Dee and Molly. These are specialty shirts that unique. You aren't going to see 10 other people wearing the same shirt to a function. I plan on ordering at least 2...I think they will make great gifts for the person that has everything. Thanks so much, Marcia! You are going to be the talk of the party, enjoy! I was all set to purchase the tee - despite the price point. However- "Chai Maintenance" is very funny - the word JAP IS NOT! It is an INSULTING STEREOTYPE, AND I DO NOT UNDERSTAND WHY NO-ONE HAS COMMENTED ON THIS. Jeff, are you Jewish? You are certainly not a woman, Do you know what's it's like to be called a JAP? There is nothing at all amusing about it. I am a Jewish woman, who rejected her religion for a long time - and part of the reason, was that awful word. I think you should take this off the site and re-design your tee, with another amusing line at the bottom, or nothing at all. Look, Joan Rivers is my favorite comedian (still), and I am also a writer, who is coming out with a line of t-shirts. I write humor pieces as well, and am first and foremost a poet. I was so offended by this shirt, that I now want to post this to my Facebook page and see what others think. Again, the "Chai line" is" Chai-sterical" (don't steal that!) - JAP IS NOT. Please respond. Hi Jean, thank you for the sharp eye. I can tell you right now, it was not our intention to have that on site. In fact, that is not even the version of the shirt we are selling. We posted outdated images and that was our mistake. Faux Real makes shirts with some pretty risque content. Humor that pushes boundaries is bound to be more subjective and as a Joan Rivers fan I'm sure you know that better than anyone. We are taking down the images now and, worry not, if you buy the Hannukah shirt all it will have is the Chai line. Thanks again for pointing out the error. I hope you still enjoy the shirt! Also, Chai-sterical is great. I look forward to seeing what your line of shirts looks like! @Mike @Jean, Thank you for pointing out this error. The image on thegrommmet.com is actually the first rendition of the design. Although I am Jewish, as a company we made the decision to remove the tagline since it is offensive rather than humorous. The actual shirt does not include JAP. I hope this addresses your concerns. If you have any questions or comments I would be happy to hear from you. @Jeff When will you post the actual Chanukkah shirt for women? I agree that the price is realistic for the printing process but, it is an item I'd wear ONCE A YEAR! That makes it too expensive. Do you have any other shirts besides these holiday ones? What is your website? And, my ugly sweater is NOT SCRATCHY OR ITCHY, and it holds its shape and color after many cleanings. Don't badmouth your competition; it makes you look desperate and unprofessional. Hi Maggi, the actual Hanukkah shirt is already posted. We just had some incorrect images accompanying it. 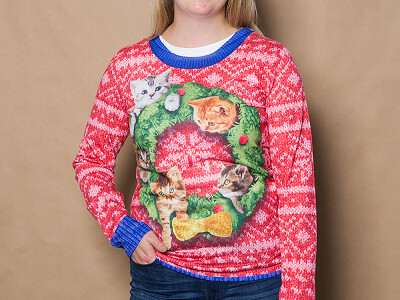 Also, congratulations for having the only ugly sweater on earth that isn't scratchy or itchy. The rest of us are extremely jealous! While the idea of your T-shirt is quite novel the price is simply not realistic especially given the shirt is polyester. I can't imagine why you think a sticky synthetic is ever better than comfy and breathable cotton. Hi Gale, glad you like it! We understand Faux Real might not be in the price range of everyone, but the reason goes deeper than the polyester (a sticky synthetic to some and a silky slice of heaven to others) to the printing process on the polyester itself. Faux Real uses dye-sublimation to creates the incredible designs you see. This process needs to be just about perfect to create the full effect. The intensive nature is what drives the price up. Love the shirt and love the other designs by Faux Real. My son, who is now 8 has owned 5 of their shirts when he was younger. They are very comfortable and durable and they certainly get noticed, he received many compliments. One problem. I have attempted to contact the company in the past and got no response. They have many shirts available in toddler sizes but in youth I believe only 1 or 2. I have wanted to buy about 8 different styles ever since he grew out of the largest toddler size. Are they ever going to make the wide range between toddler and adult? I know this is off the point of this conversation but I thought maybe the makers behind Faux Real are reading the comments. Oh, and I would purchase this for myself AND my son if I could. Hi Joe, look below at Joanne's comment. That will give you a good explanation for the price. Instead of buying a dozen, might I suggest buying eight instead? Don't deprive your family of fun shirts! Oh, I don't think $32 is too much for these t's. I've seen t's for this price and more and not nearly as "nice"! I'd love to have one in a size 5x! I love the ideas and products on this website. Keep up the good work and great ideas! Thanks so much, Melinda Jane! Hopefully down the line Faux Real can develop more sizes! Cute but not $32 cute. Sorry, I agree with other posters, most items on this site are priced too high. Love the ideas though. Good luck. Thanks, Becki! In the case of Faux Real, the dye-sublimation printing process is a big driver of the price. Also, with this and just about every product we sell, it is made by a small-scale Maker we are not trying to ruin by price gauging. We work hard to keep our prices aligned with the market, but participating in a contest to see who can discount the most, is not our style. We are trying to work with these Makers and help them succeed. I really wanted to get 2 or 3 of these because I LOVE the idea, but at $32 a pop, it's more than I want to spend on a seasonal joke. Get the price down and I'll be sure to get several. Hi Susan, understandable, we don't want you breaking the bank. If you want a detailed explanation of the price, read Joanne's response below. The intensive dye-sublimation printing drives the price, but creates incredible designs you see. You won't see that kind of style everywhere. Great idea, but too expensive. Agree with the $25 comment. Also, most likely people are going to want to buy more than one. So at $32, I buy none. At $25, I buy four. Or buy 3 get one free. With all the positive comments about the idea and all the negative comments on price, seems like you should get a little bit creative. Polyester vs cotton explanation isn't going to do it. At any rate, great idea and I hope you sell some. Hi Paul, thanks for the comment. Getting more creative with price is not as easy as it sounds. As Joanne describes below, the printing process of dye-sublimation is incredibly intensive. It needs to be perfect every time or it is no good. That process which creates these beautiful designs is a big piece of what sets the price. Also at $32, why you wouldn't buy three? I wanted to address the price comments. Faux Real uses a process called dye-sublimation printing. This means that the design is transferred directly to individual pattern part -front, back and sleeves. The transfer of the design onto the fabric happens under high temperature and pressure. The design permeates the fabric and then solidifies into its fibers and is permanently dyed so it can be washed without damaging the quality of the image. Because of this, the images will not peel or fade. Also this process achieves colors can be extraordinarily bright and vivid with a very real, almost photographic quality. The printer speed is low, so this is a more expensive to print and finish each article. And the damages can be high because any creases in the material during printing can leave blank spots. It's good to understand the manufacturing process because it is specialized and more expensive than creating a tee shirt from a roll of fabric. I think it is a fun idea and worth the "extra cost" of a T-shirt because it's a fun idea. Thanks, Frank! Hope you enjoy! @Mike I would pay this price if it weren't something that could be worn for such a short season. I agree, $20-$25 in the most I would pay for a tee shirt. Great idea, will keep an eye to see if the price goes down and would def buy. I would buy more than one but not at $32. Fran, it's a short season for years to come! You will surely get your money's worth after wearing this to three holiday parties, which you might actually get to this year alone. Thanks for the vote of confidence, Julie Ann! I have worn them and I can vouch for the comfort. It is like you are wearing air and that is infinitely better than the four pounds of itchiness that is a traditional ugly sweater. Your whole family is going to love them! I didn't read thru every comment so I may be repeating, but if it came in size XXL I would definitely buy one! Hi Thomas, they do come in XXL sizes. If you are not seeing them, it is likely because they are sold out at the moment. They should be available again soon! Mike your awesome! Nothing gets you down or stops you from being positive! I somehow found myself reading all of these comments and your responses made me laugh! The shirts are awesome! Hi Kathleen, I answered your question above. Like I said there, I, and the rest of us, found them to run true to size. They are form fitting by design so maybe that is what the reviews are referencing. Donna, thanks so much! It's a comment like yours that kicks that positivity into overdrive. My goal is to be the bringer of levity so I am glad it is resonating. I hope you enjoy the shirts because they really are awesome. I didn't want to take it off after the video shoot! That's the true beauty of it, Tracey! I assure you, if you aren't already, you will be the most popular person in the office if you get these! Yes it will, Deb! They were a hot seller. They should be back in stock soon! 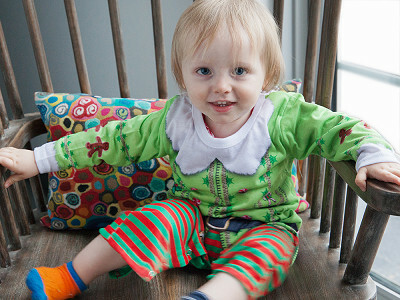 @Meri Just read the return policy - looks like I'd need to do the exchanging or have the paperwork sent to them, right? Hi Meri, that is correct! Hopefully they fit perfectly and they love them! I LOVE this idea! I live in central Texas and half the time we are decorating our trees in shorts. There is NO way we can wear true sweaters like this and not die at a party! Ya, I could see that cotton could be beneficial from a sweating/skin breathability standpoint but I also HATE cotton t's that twist in the wash (the bottom half seems to move after several washings and seams don't line up) or ones that shrink or they are made out of a stiffer less comfy cotton (cheaper so the price point is cheaper). DEFINITELY better than wool, Jeff! Especially in Texas, lol!!!! Thanks for the comment, Jennifer! 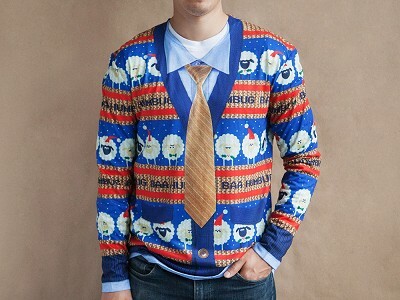 Yikes, I imagine the parties down in Texas are more ugly SWEATer parties. Faux Real shirts will certainly never lose their comfort and their design will hold as well. I hope you enjoy them! I would buy 6, but not at $32 each. IF YOU WANT TO SUPPORT AMERICAN SMALL BUSINESS, THEN SUPPORT THIS BUSINESS. THE COLORS LOOK RICH AND THE PRINTS ARE VERY DETAILED FRONT AND BACK. THE ONLY THING MISSING IS SOME TEXTURE, BOWS, BUTTONS, TINSEL. IF IT'S POSSIBLE, I WOULD LIKE TO SEE A LITTLE MORE ADDED TO THESE SHIRTS TO GIVE IT A MORE AUTHENTIC LOOK. I WISH YOU ALL LUCK FINDING A SHIRT THAT IS NOT SOLD THROUGH A NATIONAL CHAIN OR SO THIN YOU HAVE TO WEAR A SHIRT UNDER IT. Thanks so much, Jacqueline! The ladies penguins and hanukkah shirts have little jewels on them for some nice texture! We bought these on Amazon already, but the prices were much lower. . Prices for these shirts on eBay begin at $5.99-$7.99 (bidding) and between $5.99 -$17.99 for "Buy it Now" items. The sizes and styles on eBay vary, and may possibly be shirts people ordered that were too small. Luckily we bought very large sizes because wanted to be sure they fit, and we were correct to buy sizes two times larger than we normally wear. I think $32 is very expensive for the purchase of a seasonal item that will only be worn for casual fun. Tee-Spring also offers name-brand quality, independently designed tee shirts and none are this expensive. I think many people would purchase these if you could lower the price into the $22-$25 range. Our camping group designed our own on tee-spring and had to only sell 10 to get them printed for about $12 each, and sold them for $17, giving our group a profit of $5 per shirt. Please try to lower your prices, because I think it would be great for your venture to be a success, and be able to build your business quickly. Hi Betty, thanks for your comment! Let me address your last point with your first. Business have trouble building quickly when their prices are cut significantly on other sites. They don't generate the same revenue and they're forced to hustle to make up for what they lose out on. If they are supported, like they are on this site, they can hopefully get to a point in their business where they lower prices to the range you describe, but bidding competitions only stunt that growth. And just so all future commenters are on the same page, this isn't just a t-shirt. The dye-sublimation printing process for these shirts is incredibly intensive and requires absolute perfection. It's what gives you the incredible designs that will never fade. I highly recommend reading Joanne's comment above to get a more detailed description. Judging by how many sales they've made already at the $32 price point, they seem to be quite successful right now, but with further support they can continue to grow. upcoming birthday. im glad you guys stuck to it, it probably was a pain and I hope it pays you guys off handsomely. I will wear mine while grocery shopping when it comes and try to stir you up some business. sincerely, keith in Vancouver, Washington. Hello to you, Keith! With how much interest there is in kids sizes, we may have to look into offering them. That way you, your grandkids, and anyone you come across in the grocery store can enjoy them! Hi Keith, we just emailed you! Unfortunately it was too late for us to change the size, but we sent you instructions with how to exchange it no problem! I see all the comments about the price, but that wouldn't deter me a bit. These are great! I'd buy one in a heartbeat if they came in my size (I'm a plus, so even the extra large wouldn't fit me). 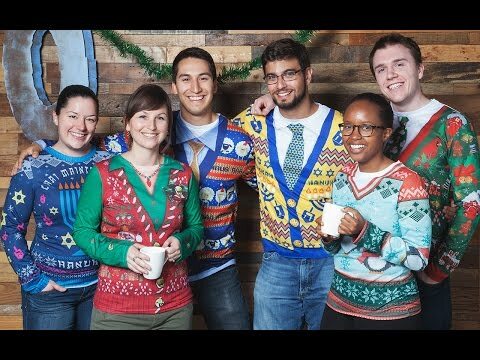 But they are adorable and funny - even though I'm not Jewish, I love the Menorah shirt! - and with printing on sleeves and back, well worth the price. Good job, Gray Brothers! Don't worry, Keith, we have all the adult sizes. We are evaluating kid sizes as well. Mary, thanks so much for the kind words! We have sizes ranging from s-xxl. If you don't see them at the moment, it is because they are temporarily sold out. We should have everything back in stock shortly. In time for you to wear this hilarity for the holidays! Why are there not more Christmas t shirt choices for women? Two is just not enough choices. The men's shirts seem tackier than the women's. Come on guys...we want to be festive and tacky too! Hi Sharon, the Christmas shirt options are the same for men and women. The ladies shirts have added texture with jewels along the neck line, too. If tackier ones become available we will certainly look to add them! Raise the stakes in the holiday hilarity department with Faux Real’s T-shirts. 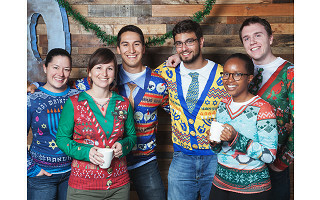 Their intentionally tacky designs emulate ugly holiday sweaters in every way, without the bulk and itchiness. Soft, breathable, and comfortable, these T-shirts look the part without any of fuss—but with all of the festivity. Given that they look like the gaudiest of attire, it’s a pleasant surprise how nice and durable the fabric feels. Brothers Jeff, Scott, and Ben Gray developed these T-shirts when they noticed ugly holiday sweater parties popping up everywhere. Using a dye-sublimation printer, Faux Real creates shirts that capture every photo-realistic detail of an ugly holiday sweater, right down to the (faux) snowflake buttons.